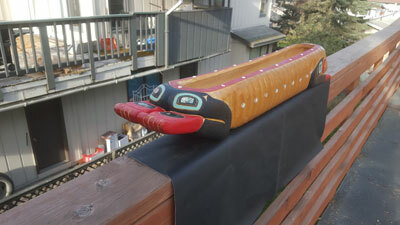 I am a self-taught Tlingit artist and blacksmith/knife-maker. I have been carving since 1968. My first woodcarving experience came in 1963 when my dad, the late Very Reverend Father Michael Williams, gave me a pocket knife when I was just seven years old. 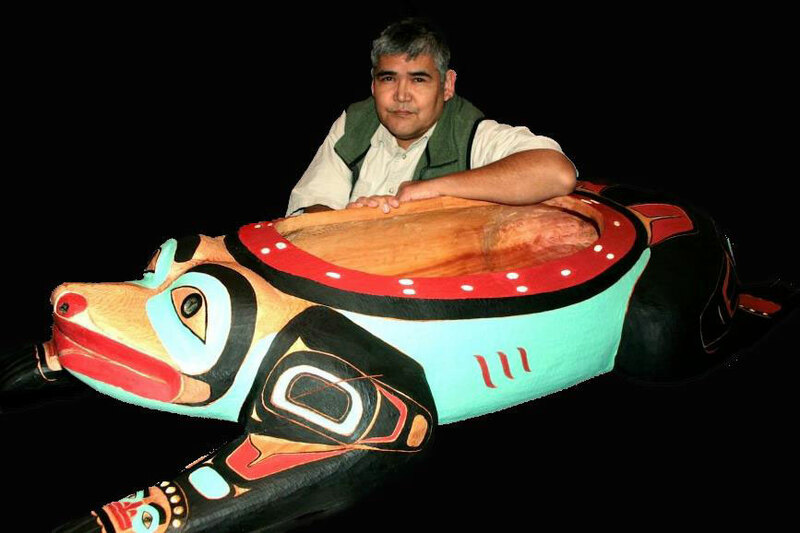 The very first carving I did with my new pocket knife was a tiny wooden Tlingit canoe, which I gave to my Dad. When my father looked at the carving he was very impressed with my first crude carving effort. Upon seeing the carving he exclaimed to his wife; "Wow, he's going to be a carver someday." The memory of the moment and comment have never been forgotten. After moving from Hoonah to Sitka I began to aggressively pursue woodcarving in part because I was curious about it, but mostly because it was a hobby that my father tried to teach and encourage all his children to learn. Through the years I continued trying to learn how to carve on my own. As the years went by I met fellow Tlingit artist and Master-Carver Wayne Price. Wayne gave me a few valuable carving lessons and taught me the basics of Mask Carving. During my time with Wayne, I was also taught the basics of how to make carving knives and other traditional tools of the Tlingit. I went on to learn the trade of Blacksmithing and received verbal Blacksmith lessons from my Uncle Richard King, a well known and renowned Tlingit blacksmith. It was a long struggle, but I continued to prevail and developed my love of carving and Tlingit art. I worked long and hard trying to perfect my artwork and worked to improve my forged knives. My growth as an artist and as a Blacksmith went hand in hand. My art has reconnected me with my heritage in ways I could never have imagined. 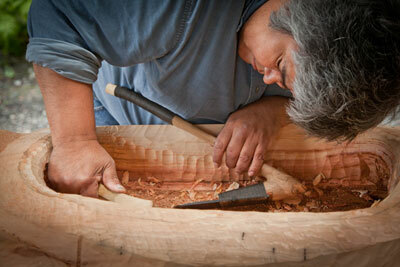 I was commissioned by The Alaska Native Heritage Center to carve the feast bowl that you see in the above photos. I was hired to do the carving in the summer of 2008. Carving the bowl from start to finish took approximately 4.5 months. 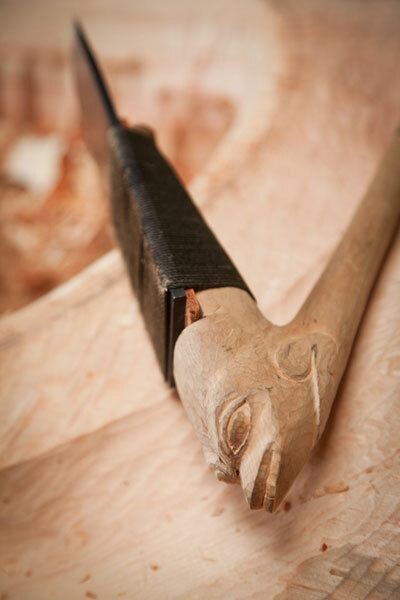 Most of the carving was done completely by hand, and mostly with traditional carving tools inherent to Southeast Alaska and to the Pacific Northwest Coast Tribes. I made most of the tools that I used to carve this bowl. The bowl is carved from an Alaska Red Cedar log that was 4.5 feet in diameter. The original log weighed in at approximately 5000 pounds and was 5.2 feet in length. 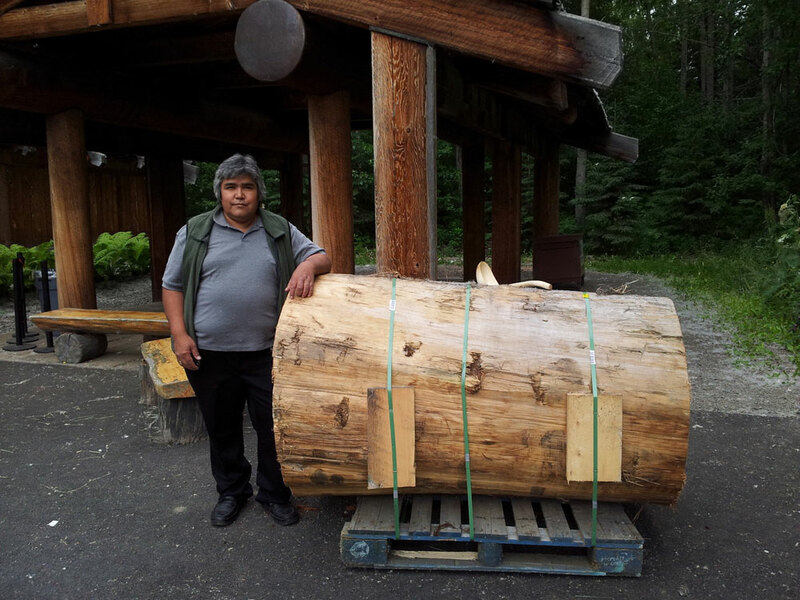 The log was harvested in Hoonah, Alaska, a small native community located on Chichagof Island, the largest of the archipelago islands in Southeast Alaska. It was cut and split with a chainsaw, an ax, a hatchet and several splitting wedges to remove the best piece of available wood from the log that produced this carving. minimize checking and cracking. You can see the chisel marks on the inside of the bowl. The finished bowl measures 5 feet in length and weighs about 65-70 pounds. The colors are traditional, but the paint is semi-traditional consisting of acrylic paint medium and a combination of natural pigments. The red is red acrylic with iron oxide pigment. The black is black acrylic mixed with crushed and powdered charcoal. The blue-green teal color is from pale green acrylic mixed with copper oxide pigments. The bowl has abalone shells inlaid into the eyes, nostrils and on the haunches (buttocks). The forefeet and rear-feet have "cats eye operculum shells inlaid. The rim of the bowl has faux operculum shells made from cut, ground and shaped clamshell pieces. My Carving Adze made by me. The adze above was made by me. The blade was made from type O-1 tool steel properly heat treated and tempered. It is bound to the haft in the traditional style using oiled twine and a leather strip beneath the steel to minimize slippage. 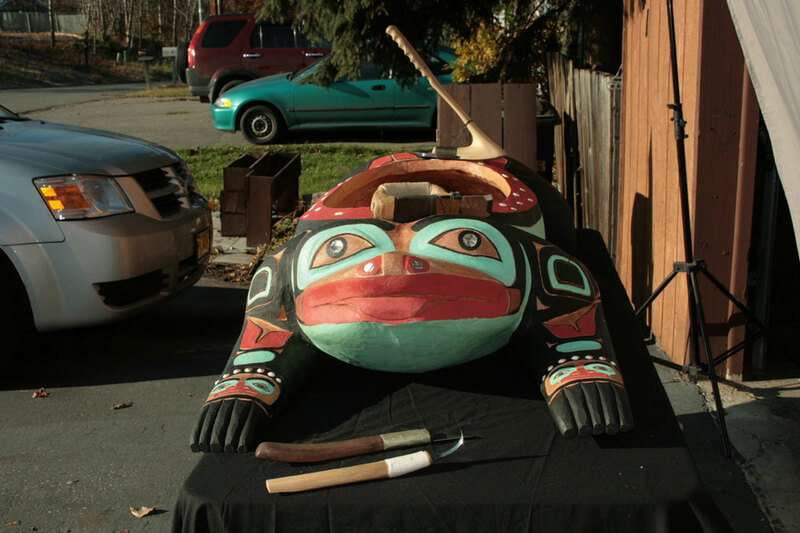 The adze was dedicated and donated to The Alaska Native Heritage Center after the bowl carving was finished and dedicated. The carving on the knee portion of the adze head depicts a frog. The wooden handle of the adze was made from a branch and knee portion of a mountain ash tree trunk. Small Yellow Cedar Frog Feast Bowl. Abalone shell & operculum shell inlay. 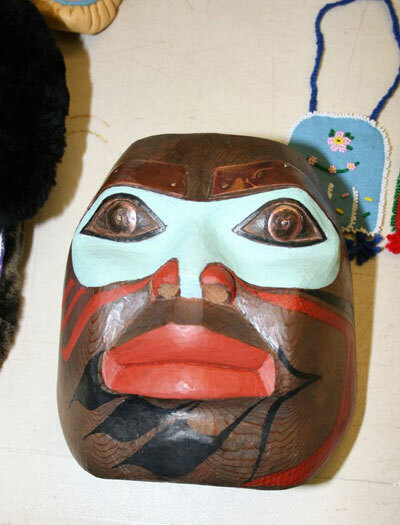 The dark colored mask below is made of red cedar with acrylic paints. The eyes are inlaid with copper. The eyebrows are copper tacked in place with copper nails. The nails are peened and riveted permanently in place from the inside of the mask. The wood was stained with natural materials to give it a much older and aged appearance. None of the carvings are sanded and were all carved smooth, as evidence of the remaining knife marks left from the woodcarving procedure. This is a traditional approach that I still observe, and never use sandpapers on any of my carvings. 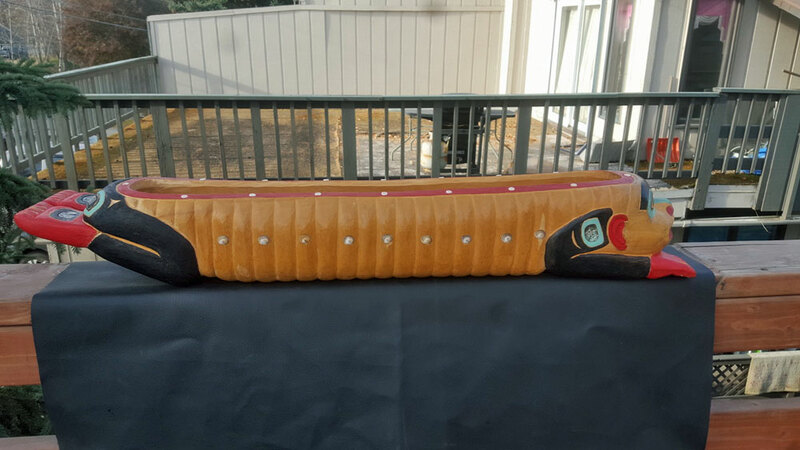 The red cedar carving below represents a "Smiling, or Laughing Raven." The original Laughing Raven was created by my part time mentor and master carver Wayne Price. This is my interpretation of his design, but is completely different from his. 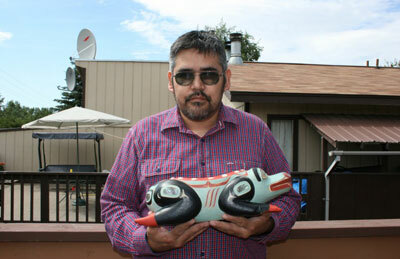 Wayne taught me a few basics and showed me how to improve on my mask carvings and designs. 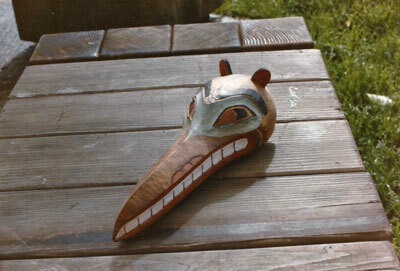 The mask is approximately 18" long and about 3" wide at the head. The Mandible (aka "beak") makes up roughly 2/3rds of the overall length. The ears on the head were carved separately and then inlaid. 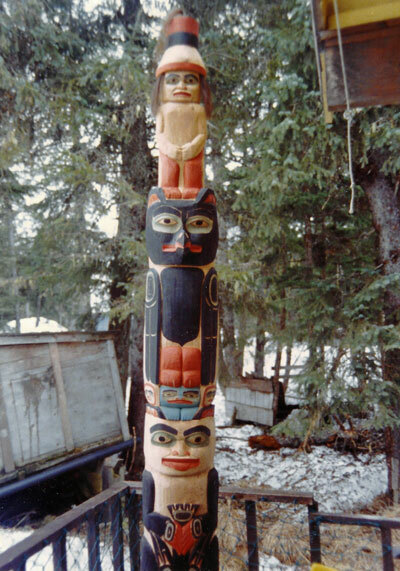 Below is a picture of an 8 foot totem pole that I carved in 1991/92. 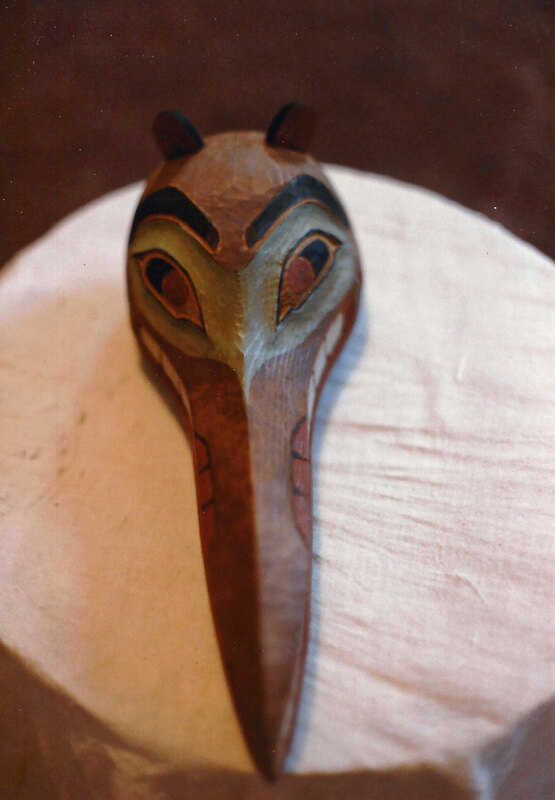 Our totems were traditionally interpreted and read from the bottom up. Most people who don't know about totems tend to think of the bottom of the totem as the least important, when the opposite is quite true. This totem is based on a very old totem pole and is my interpretation of that old pole. The bottom figure is the beginning of the story, and so therefore, the beginning of the totem pole. If the totems are interpreted correctly, the events depicted follow the totem from the base, bottom figure upward. The bottom figure is "A Brown Bear" clan, and is grasping another smaller raven in its paws. Above and on the head of the bear, between its ears, is a representation of a rock. Even rocks were believed to contain some kind of life because living things grew on them. Beside the "Earth, or Rock Spirit", are 2 other spirit carvings. These are helper spirits to Raven, who sits and is perched on the Rock Spirit. Raven sits in observance of his surroundings. Standing on the head of Raven is a "Lookout Man" who is wearing a feast hat with 2 rings. The feast was misnamed "potlatch," and the figure was also misnamed "Potlatch Man wearing a Potlatch Hat." 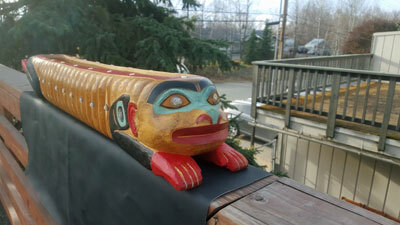 The top figure of the totem is the only part of this totem pole that was inlaid. The hair that you see inlaid into the head and beneath the hat of the "Potlatch Man" is actual real human hair. That hair is from my late sister, Anita M. Williams, who passed away from a heart attack several years ago. Below are several pictures of my Woodworm Clan Feast Bowl. It contains abalone seashell inlay in the ovoids and seashell beads inlaid on the rim. Cats Eye operculum seashells are on the sides and silver dimes are inlaid in the eyes. The overall length is 3 feet. 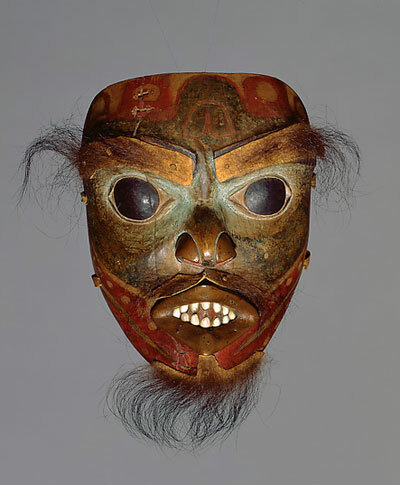 The mask below comes from my hometown of Sitka and supposedly represents a so-called "Shaman's Spirit Mask." Brown bear fur was used for the eyebrows and beard. Natural operculum seashells were inlaid to represent teeth. The lips have a single piece of shaped copper riveted and attached. This is a mid-nineteenth century piece to illustrate the use of operculum seashell inlay. James can be reached directly via email at froglips@gci.net .